From the moment we met Michael, we were captured by his warmth. He listened and guided us through the process of creating our ceremony, with ease and pleasure. The ceremony itself was beautiful, just as we had discussed, with some surprises and humor through out. Since my husband and I are coming from 2 different religions, Michael was able to subtly include both. I highly recommend him to anyone. Andrea and Josh Robins, July 14 at the Chesapeake Bay Maritime Museum. We had a FANTASTIC wedding day and it was made all the more special having you marry us! It really was A PERFECT Wedding Day! Most weddings we have been to, you see the couple standing at the alter with a very serious face; however with ours you really were able to bring out our personalities. We felt so comfortable and were able to laugh and smile throughout the ceremony, Thank you! We whole heartedly enjoyed our time with you as well as my parents and even guests of the wedding enjoyed you, your cheerfulness, humor, and your words on marriage! Thank you for being a part of our wedding. Everyone said they loved the ceremony and your words and how you were able to inject just the right touch of humor into the ceremony. From the first time she talked to you on the phone, Angela knew you were the right “fit” for us. You took the time to talk to us, learn about what was important to us as well as some of our important memories with our parents and were able to work those into the ceremony. Your calm demeanor made sure that neither of us were nervous and we were able to actually enjoy the ceremony. The photos show a lot of laughter and that’s what we’ll remember most; you gave us exactly what we were looking for and kept things serious but light. We can’t thank you enough. Working with Michael was a joy. From the start, he was very understanding about what we each wanted for our wedding ceremony, especially regarding our interfaith families. We knew we wanted a brief ceremony that not only respected everyone in attendance but also was personal and special to us. Michael took the time to get to know us as a couple as well as guided us throughout the entire process, making us feel comfortable and confident. Our ceremony was everything we wanted it to be - as well as perfectly brief without feeling rushed - and we are still having guests comment on how touching his words were. We feel truly honored to have been married by Reverend Feehley and are so happy that we chose him to be our officiant. We think you did a phenomenal job, couldn't of asked for someone better. You brought tears to my eyes as you talked about my father, thank you so much for incorporated that into our ceremony. You were just the perfect officiant for us, thank you for remembering to tie in special moments of life (with my stepdad) along with humor. We hope to see you again soon Michael! I cannot thank you enough for all of your help with our big day. It was absolutely perfect. I have now had time to look at hundreds of pictures and the wedding video and I am able to reflect on that day with complete joy and satisfaction. It meant so much to me that you were always willing to meet up and chat throughout the planning process. You have such a calming presence and that really came in handy since I had my nervous moments. The ceremony was so perfectly "us". Your words really impacted a number of our wedding guests and we've heard lots of great feedback from friends and family. We are so lucky to have stumbled upon your website because I cannot imagine our wedding day with anyone else standing by our side. Thank you for being a part of our day Michael!!! Everyone said they loved the ceremony and the words you spoke were meaningful and really represented what true love and marriage is. Thank you for everything, we will never forget it nor you! Thank you so much for being a part of our wedding. We are so happy that we had the opportunity to met you and get to know you. You were the perfect person to unite us in marriage. We wanted to thank you for the wonderful service and candor. We were truly delighted and inspired by your words and truly couldn't be happier. We also wanted you to know, that almost all of our guests and family came up to us saying how much they enjoyed your words and how touched they were by the ceremony. We particularly cherish that because as you know, Natasha's family is orthodox and the traditions differ quite a lot. Natasha's grandmother, who is a very religious person, told us that it was absolutely wonderful. I don't think Natasha or I were particularly nervous, but last minute preparations may have distracted us a bit, that is why we were extremely happy with how calming your presence was. Thank you for making it such a magical experience for us and our guests. We will always try to live by your sage words of wisdom and we will always have a special place for you in our hearts. If you ever need anything from us please let us know and we are happy to help. Please stay in touch with us, and we will do the same. I can't believe it's been 4 weeks already! What a wonderful gift you gave us by agreeing to be the officiant at our wedding! We couldn't have asked for a more perfect person to join us as husband and wife. Your kind, thoughtful, and gentle nature, your giving spirit, and your sense of humor fit perfectly with us as a couple, with our family and friends, and fulfilled every hope that we had for our wedding day. We thought it was our own starry-eyed memories, but in looking at the wedding video, the pictures we just received this week, and the feedback from our family and friends, we know that you were an integral part of our special day, and our lives moving forward. Thank you for sharing your time, your spirit, and your passion for ministry with us. We appreciate the time you spent with us, and hope that we will meet again in the not-to-distant future. The Cogliano/Nash wedding July 19th at Kentmorr Marina. Reverend Michael, Thank YOU for making our wedding day so special. We loved your ceremony. It was beautiful, meaningful, and informative. Thank you also for visiting with me prior to the ceremony.....you were a calming presence for me. Thank you too for for acknowledging how wonderful our parents are...they really enjoyed the day. You were so easy and wonderful to work with. If you ever need a referral please do not hesitate to give out our contact information. God Bless you too. Colleen The Hogan/Onofrio wedding, Sept. 8 at Perry Cabin. Mike and I would like to thank you so much for performing our ceremony. We both were so touched by your words and will hold them dearly in our hearts. Again, thank you so much for helping make our special day so special and wonderful!!! Everything about the day was perfect. Our wedding on November 30, 2013 was outside in St. Michaels and a little chilly. We found Reverend Feehley on the internet and when I saw the website I thought now this is someone that loves his job. I loved how organized everything was. So we set up a time and place to meet. After we met I knew with the spectacular sense of humor that he was our guy. Weddings can be so by the book and informal. .. but Reverend Feehley takes the time to get to know you and your family and guests. Reverend Feehley communicates with you to make sure he knows you have your marriage license and who is doing music or reading poems and which vows would you like, are you doing a candle or sand or both? He had all of the options available and it made our life so much easier having all the ideas already to choose from. He also even has a back up in case something happens family emergency, illness etc. I worry a lot so that put my mind at ease. The ceremony was great. It started on time. He made sure all the guests were there and seated so I could come out and nothing would interrupt our ceremony. We laughed and had a beautiful 30 minute ceremony with the pouring of the sand and a reading from a dear friend. We even chose the modern vows from the website. Our wedding is one day I will never forget, Reverend Feehley was so sincere and made everyone feel welcome, people even asked how I found him and when I said the internet they didn't believe me. He is a talented man and loves the work he does which made us appreciate him that much more. Thank you so much for making our wedding so beautiful. I will recommend you to all of my friends family and anyone I meet who wants to have a spectacular wedding day. continue our new relationship as our marriage grows. Andy and I had the chance to reflect back on our wedding ceremony day and we feel so incredibly blessed that we met you and that you agreed to marry us. Although we were civilly married last December—we think of our official union as the day that we brought God into our ceremony. Your sermon was beautiful and I know we had many guests very impressed with how they could relate to you and your wishes for us. We THANK YOU so very much from the bottom of our hearts for your blessings for now and the future. We agree that we will always remember what our rings stand for – our promise to one another—our families and God. Best wishes to you always and we also wish you much great health and happiness to you and yours. We have been married a little more than a week now and have enjoyed every moment! We can not thank you enough for our beautiful ceremony! We have gotten so many compliments about you and our service and we owe it all to you! We are off to a great start and are so happy that you were a part of it from the very beginning! May we have a mailing address to send our official thank you to you? You helped make our day absolutely perfect and we are glad to be family now. We are the first of our group of friends to be married and you are definitely the first person we will recommend to them! Again, thank you for starting us off in the right direction! We and the family often talk about that week and our day. EVERYTHING that day worked our so perfectly...(except the wind got the ceremony table cloth a little off kilter....at least that's my story and I'm sticking to it) but each part was so very memorable. We could not be happier with the ceremony you led and how very meaningful and memorable you made it. It was inspirational, elegant and a great bonding of all who attended. I think your outstanding work is evident in how often all of the family continues to talk about the ceremony and the whole day. Maybe we'll see you at the RED HEN or around town next time we're down to Easton. We can't thank you enough for such a beautiful and moving ceremony. We have received compliments from all of our guests on how great you were. I don't think there was a dry eye in the room! But also lots of laughs!! :-) We are so blessed to have met you and you will always hold a special place in our hearts. Thanks for everything!!!! Festa - Watson wedding, June 1st. Chesapeake Bay Beach Club. We are freshly back from our honeymoon and saw your note. Thank you so much for everything you have done to help make our wedding a success! We had a wonderful time and couldn't have done it without you. It was our pleasure to have you play a role in our special day, and we look forward to staying in touch and hopefully seeing you in the near future out in Easton. Both of our sets of parents enjoyed meeting you and everyone commented to us on how pleasant and heartfelt your words were at the wedding ceremony. Please have a wonderful holiday season and a very happy new year! Michael, thank you so much for coming to our rescue! We sincerely appreciate your willingness to perform our wedding ceremony with such short notice. We feel truly blessed. We very much appreciated how you made sure to take the time to talk with us to find out what aspects of the ceremony were important to us. Your positive attitude and fun sense of humor made the ceremony special. We truly enjoyed working with you and hope to keep in touch. Hi Michael- We are finally getting settled here in Maryland and I just wanted to take a moment to say thank you! We have no criticism for you...except maybe that you didn't end up wearing those flip flops!! You were wonderful and we are so glad we had you on our wedding day! It was great to have someone give some structure to getting everyone out the door and the ceremony started on time. We had so many compliments on choosing you to officiate our wedding, quite a few of our guests let us know that it was the best ceremony they had ever attended. So I just wanted to let you know how pleased we were with everything. Gardner/Ocampos wedding, May 21st 2011 in Salisbury.
" Michael, Thank you for all of your kindness. You made our wedding day even more special then we could have imagined. I had numerous people asking me if you were a dear friend of the family before the wedding. Everyone was shocked to find out that our friendship began due to the wedding. I found it so easy to speak with you, find comfort in you, and to take your advice (as I would a with a family member or dear friend). I hope our friendship continues on and I look forward to talking with you soon. Your soothing nature is every Brides dream. I hope you give the pleasure of your company to many more Brides to come.
" Michael, Thank you for your kindness, for your humor and wisdom, and for helping us to take this important step in our life together. We could not have asked for a better friend and guide through this process, and we are so glad that you have been a part of our journey. From the very first, we have enjoyed the time and conversations we've shared with you, and we'll keep those memories always. " " We wanted to thank you for everything. You were very easy to work with throughout the entire planning process and your sense of humor was refreshing and helped make the planning process less stressful. As far as the actual ceremony, Jill and I really enjoyed it and we also got some great feedback from our friends and family. It was exactly what we wanted - original, meaningful, and relaxed. We liked how you incorporated your sense of humor but still recognized the importance of the ceremony by taking a more serious tone when appropriate. It was the perfect balance! Lastly, we appreciated how you sought us out after the ceremony to give us some heartfelt advice on what it takes for a successful marriage based on your own experience. It became obvious then that you really enjoy what you do and take it very seriously. We will definitely recommend you to others who get married in the area. Thanks again for everything." "From the moment we met Michael, we felt completely comfortable and we knew he was the one we wanted to marry us. He was with us throughout the planning process with answers and advice. On the day of the wedding, he came to each of us separately to make sure we were ready and happy. Everything he said during the ceremony was meaningful and beautiful while his humor and charm were quite refreshing. One minute I was on the verge of tears and the next I was laughing. The ceremony was heartfelt yet relaxed and natural which is exactly the way we wanted it. We received so many compliments from our guests and both of our families loved Michael. 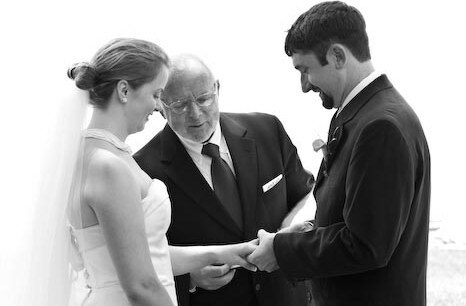 We could not have asked for a better officiant and we are grateful for the role Michael played in our marriage." Thank you very much for being a very important part of our special day! You did an amazing job, and was a great wedding service. Thank you for adding something about the Resurrection, as we did not want to forget that it was also Easter. Thanks again, it was perfect! A special thank you for a beautiful ceremony...everyone thought it was great...their married life started off with special thoughts and great advice! We were so lucky to find you....and almost a neighbor! We cant thank you enough for your services at our wonderful wedding. We will remember that day for the rest of our lives and you will be remembered as well. All of your words were loving and kind and we could not have had a more wonderful minister to marry us. Thank you again, and God bless you and your entire family. I'm sure they are as wonderful as you. Thank you so much for the wonderful ceremony. It was more than we expected. First of all, thank you for agreeing to do our ceremony with just a month's notice. Also, thanks especially for accommodating our last minute changes and for making sure everyone was coordinated before the ceremony began. I was a little nervous after our rehearsal the day before since we hadn't worked out some of the details with the ring bearer & how my dad would hand me off, but you made sure it all worked out perfectly. I also found your delivery to be very calming, and despite thinking I would be nervous, it turned out to be enjoyable and I was able to relax and enjoy our ceremony. "Thank you very much for officiating our wedding. It is difficult to find the right words to truly express how grateful we are and how perfect the ceremony was. We knew from the first time we met you, and from my first conversation with you, that you were meant to do this for us. Our parents and friends also felt so comfortable with you, enjoyed the beautiful ceremony, and were touched by your message to us and to them. You are a special person, and we are very grateful you could share your gifts with us. We hope you and your wife are in good health." Thanks so much Michael!!! We thought you did a beautiful job and we felt that the words you chose were just perfect for us. On a personal note I couldn't have found a better place or way to start my marriage with Art. I couldn't be happier!! to reflect on why we were truly there and his words greatly added to our ceremony. We had multiple guests of various religious come up to us after the wedding and say, "That was the nicest wedding ceremony I have ever been to." Again the only word to describe our experience with Michael was fabulous! We enjoyed your humor throughout, you were a good fit to our fun filled wedding! I think you were a bigger hit than the two of us which says a lot about your personality and deliverance. Your words were meaningful to us and flowed effortlessly which is something we will always remember. Your spirit is amazing and we thank you from the bottom of our hearts for uniting us. Our daughter's wedding day was like a dream. The beautiful atmosphere and timeless magic is forever in our family's memory. You were a part of that, and we are grateful to have found you. Your relaxed demeanor was so appreciated.The words you delivered with such ease, speaking to each and every one who was gathered to witness this wonderful moment, and it is clear that you have a special gift. Thank you so very much for sharing that with us. AJ and I would like to thank you for making our day more special than we could have ever imagined, especially with such short notice. You made us both feel comfortable and more at ease at a time when we were both stressed. Your reading of our vows was genuine and special and made me appreciate AJ even more. Even our guests commented on how lovely the ceremomy was. It was truly a very special event and I am glad that you were able to be a part of it. Thank you again. Michael, Thank you so much for everything! You made our day more special than I had ever imagined. We received so many compliments on the ceremony and so many people asked how we found you because you seem to make everything so personalized. We couldn't have asked for a better day or a better person to oversee the biggest day of our lives. You made it so easy for us to relax and make the ceremony our own, something no one has seen before. I'll be passing your name on to anyone I know getting married in the area! Thanks so much for everything. You did a fantastic job. Matt and I felt at total ease throughout the entire ceremony. It was a perfect evening. Thanks again so much. We are so happy and ready to begin our life together as husband and wife. Thank you for the wonderful ceremony and your kind wishes. Your attention to detail and inclusion of our wishes and personalities made our small, intimate gathering feel inclusive, loving and moved everyone to feelings of hope and happiness. I just want to tell you how many compliments I received on the ceremony... it was great! "We wanted to thank you so much for officiating our wedding this month. From our first meeting, we were struck with your quiet confidence and upbeat personality. We knew as we were planning the wedding that the one thing we did not need to worry about was your role. In planning the ceremony and vows, you were very helpful in suggesting ideas and in smoothly incorporating our ideas. We particularly loved the way you worked the hand fasting into the more traditional ring ceremony. The wedding itself went so smoothly and you were a big part of that. A number of people asked us afterwards if you had known us for a long time as that is the impression they got from the warm ceremony. Considering we had met only a month before, that was a nice compliment. Thanks again for helping create a special day that we will remember fondly forever." "Thank you for being an integral part of our special day, Michael -- from the first meeting, your experience and wry humor put us both at ease. Our family and friends continue to compliment us on the simplicity, beauty and power of the ceremony you performed for us; it expressed our personalities very well and made our wedding day unforgettable. We are so glad we found you!" "Michael, You were fantastic. Thank you! We loved the messages in your ceremony and I loved the small talk on the side (helped keep me calm). Thanks again!" "Michael, Thank you for assisting in making our wedding day absolutely wonderful. You went above and beyond to make our ceremony suit us perfectly. We can't thank you enough." "Hi Michael, I just want to say thank you so much for officiating our wedding day and making our day so special. Everyone thought you did a beautiful ceremony!"